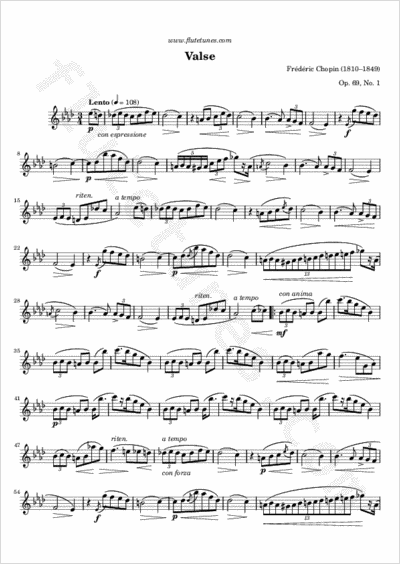 This famous waltz was written in 1835 and dedicated to Maria Wodzińska, with whom Chopin had fallen in love; however, her father did not want her to marry a young, poor musician. That's why this is also known as “The Farewell Waltz”. The beginning theme of the piece, marked con espressione (“with expression”), is melancholic and nostalgic, and reaches a small high point with a fast flourish. The second part is marked con anima (“with soul”) and is somewhat more cheerful that the previous theme, but soon gives way to the same first theme. After this second rendition of the first theme is a third, more playful theme, marked as dolce (“sweet”).